Dabeli is a famous street food of India with its origin in the Kutch region of Gujarat. It is a spicy combination of boiled-mashed Potatoes, a special dabeli masala, Lemon juice, Coriander, and Tamarind chutney. The perfectly blended filling is placed between pav and served with a chutney made from Date, Garlic, and red chilies. 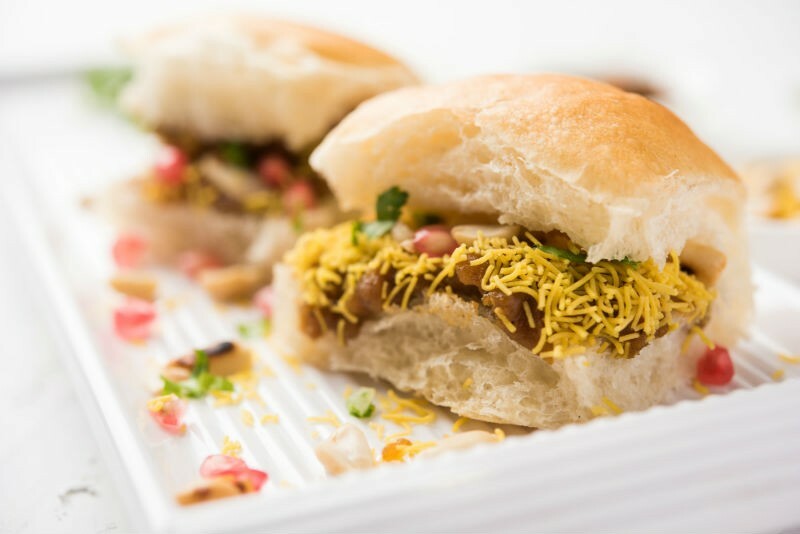 Chopped Onions, peanuts, sev, and pomegranate are used as a garnish for Dabeli. Dabeli is also known as Indian burger which is a very tasty potato recipe with the sweet and spicy combination. It has resemblances to the American Burger and can be a version of the Indian Burger similar to vada pav. Apart from Protein, dietary fibres and carbohydrates, Dabeli contains manganese, copper, magnesium, potassium, iron and Vitamin C. Potato is the chief ingredient in Dabeli which predominantly contains carbohydrates and hence it is easy to digest. Potato also has sufficient amount of fiber which stimulates bowel movement, enhances the secretion of gastric juices and prevents constipation. Fiber helps with flushing cholesterol out of the arteries and blood vessels, and hence improves the heart health. Potatoes are extremely beneficial in reducing internal as well as external inflammation. Potatoes also consists Carotenoids (lutein, zeaxanthin) which are key for having a healthy heart and smooth functioning of other internal organs. Tamarind contains a good amount of iron which is required to maintain the red blood cell count in the body to ensure proper oxygenation of muscles and organs. Tamarind contains several antioxidants and vitamin C which enhance the immune system. It also curbs various infections due to its antiseptic and antimicrobial properties. Previous articleHow Many Calories Are There in a Rajma Chawal & Does It Have Any Health Benefits?